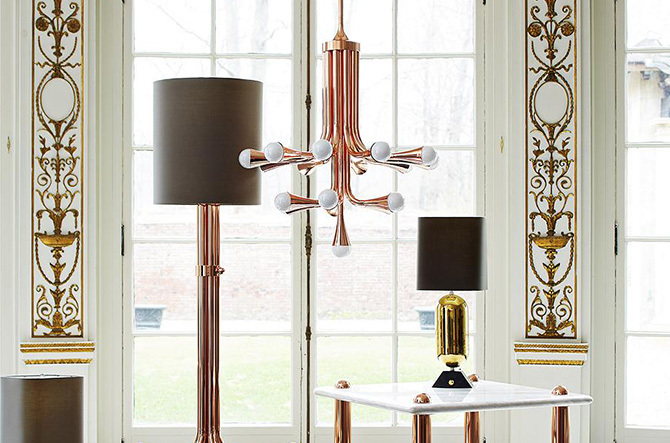 When it comes to chandeliers, one size definitely does not fit all. There are nearly infinite possibilities, from traditional to experimental─and here’s where the fun begins. 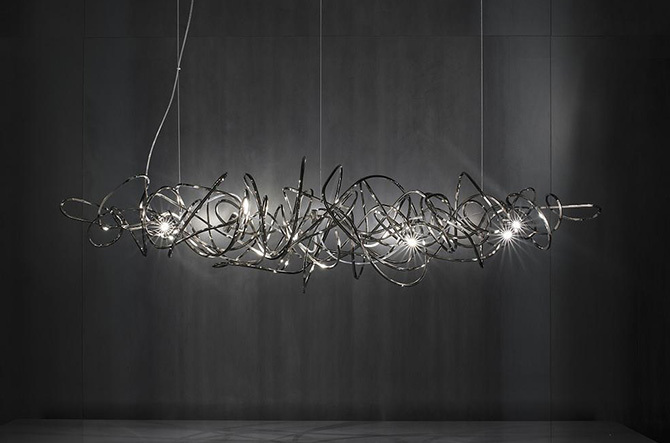 We’ve rounded up 10 of the best new chandeliers that put avant-garde expression within reach for virtually any design scheme. 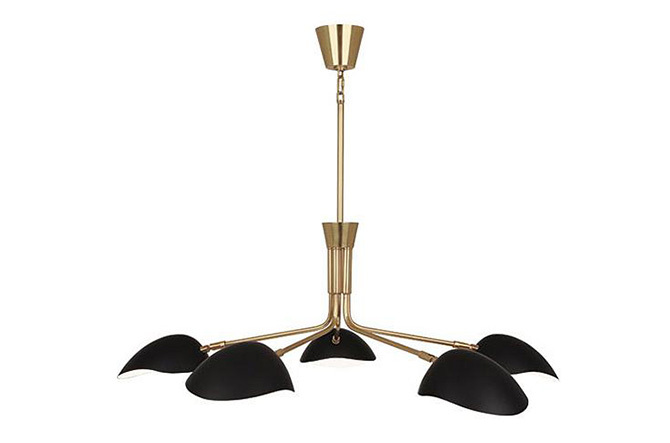 A little mid-century, a whole lotta glam. Jonathan Adler’s signature style shines in this retro-inspired look that doesn’t quite reference the past and definitely looks to the future. Right on trend with its rose-gold finish, Ultra makes a strong case for combining luxe finishes with an industrial bent. Industrial elegance may seem like an oxymoron, but we think Roberto Ricca’s Liberty line can be explained no better way. With a nod toward Stile Liberty (Italy’s version of Art Nouveau) and Art Deco, this design is an amalgam of influences and offers endless reinterpretations by adjusting the pipes to your liking. Back to─well, not basic. Minimalism as a movement is more about thoughtful simplicity of function than bare-bones elements in a slapped-together sense. Andrew Neyer’s deliberate, streamlined design is elegantly practical and, as its name implies, moveable for a variety of silhouette options. Controlled chaos as a concept might seem somewhat "out there" for a dining room chandelier, but this fixture’s raw energy manages to retain an element of elegance. Terzani is known for creating showstopping designs, and this is no exception─try in an installation where the light can be the center of attention. And now for something completely different─Artemide always brings innovation to the table, exemplified to the extreme in this experimental design. The clear leaves suggest a chandelier in the most abstract of terms, and its intricate play of light proves this is no wallflower. 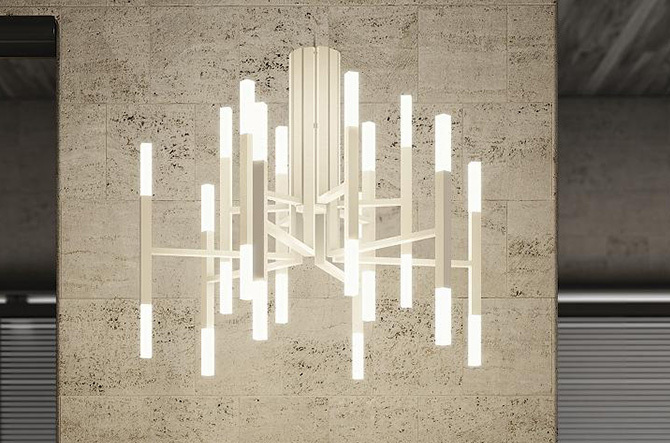 Reduced to its most basic elements, the chandelier features more than one light suspended from a central fixture. 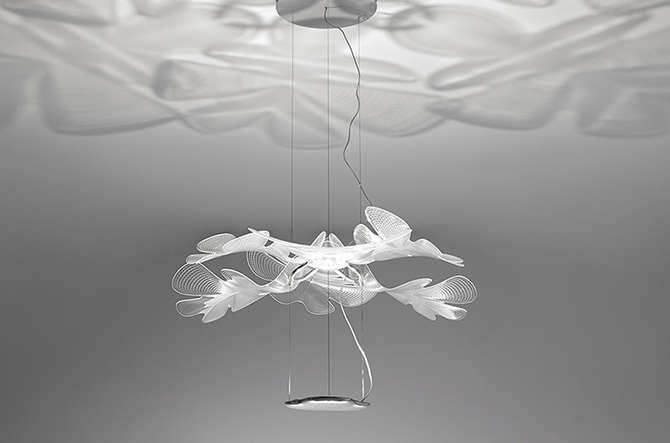 Opening this interpretation, Robert Abbey designer Rico Espinet has drawn from his background in sculpting to fashion the Racer Chandelier with simple, elegant and adjustable shades that resemble racing helmets. 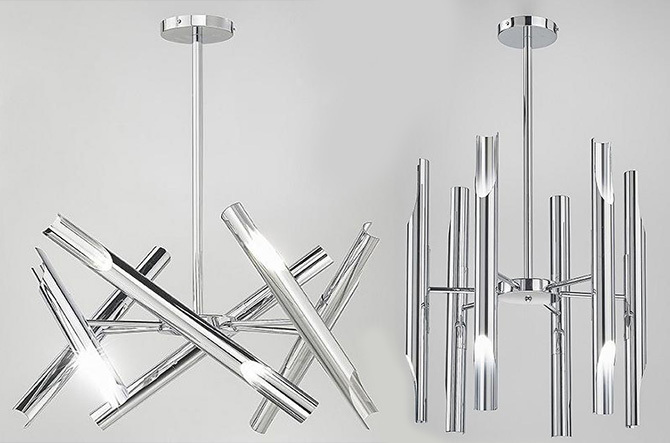 Linear suspensions can serve the same purpose as chandeliers, minus the traditionally round silhouette. 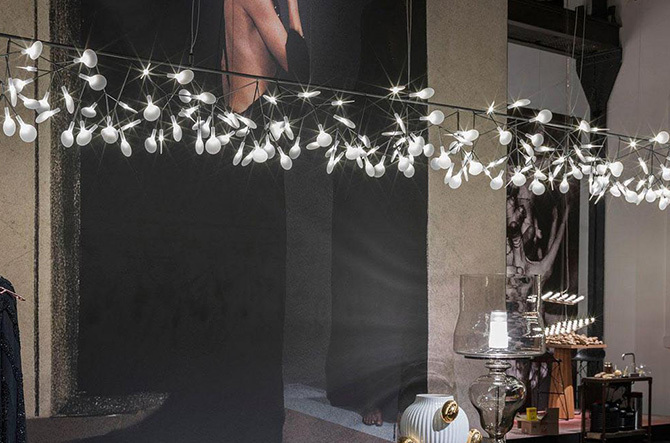 The long, thin profile is instantly modern, and this adaptation of Moooi’s Heracleum LED petals pushes the envelope of what even a linear light can be─here, an ever-expandable iteration of Bertjan Pot’s much-loved design. We’ve seen The Light, and it is good. 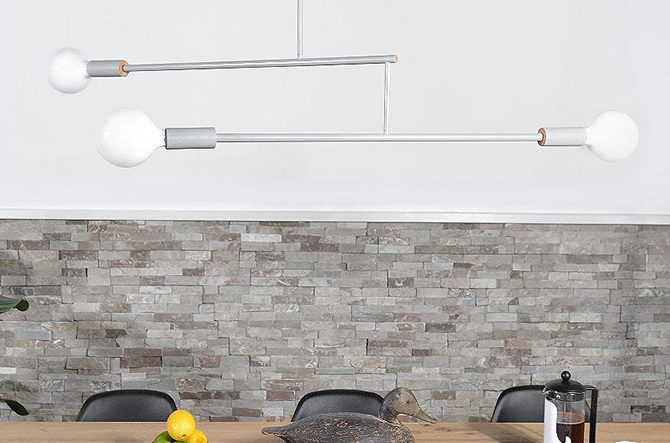 The most traditionally chandelier-like of our selections, Cristian Cubina’s interpretation for Alma Light is nevertheless utterly modern; an abstraction of an old-fashioned, candle-powered chandelier in strong, vertical lines. Craving a modern installation, but just can’t cut out crystal? Swarovski’s got your back with this sumptuous swag. 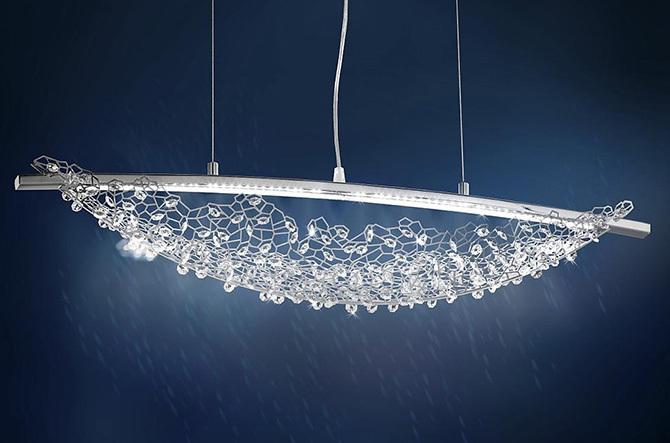 It combines the glitz of cut crystal with the cool strength of stainless steel, and even manages a techie touch with an integrated LED light source in the suspension’s main bar. A string of pearls is quintessentially traditional─but the Pearla from Eurofase is decidedly not. 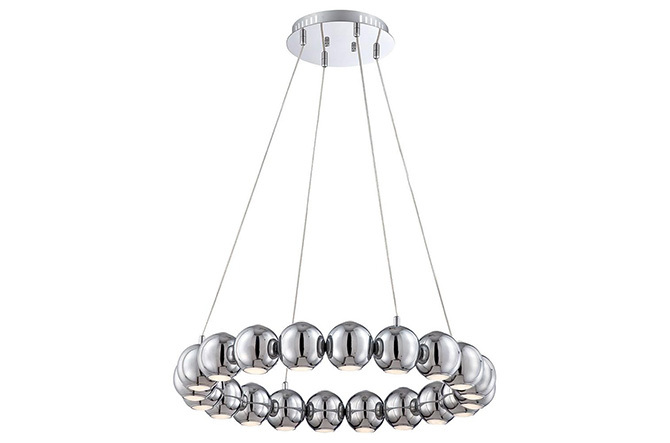 An LED light source diffused by a prismatic Fresnel lens is hosted by each chrome “pearl,” which are all arranged on the same plane for a modern realization of chandelier-like illumination.